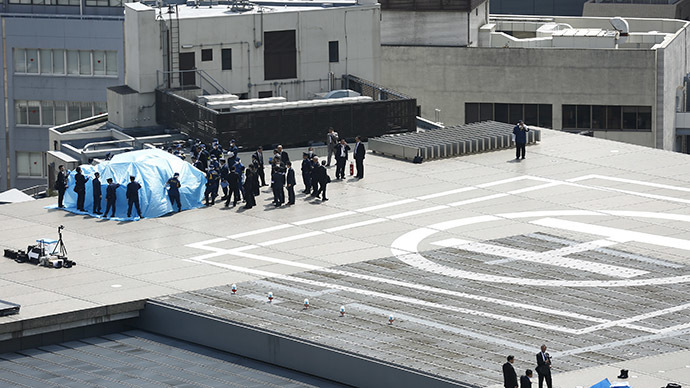 A 40-year-old Japanese man has taken responsibility for launching a drone with radioactive material that landed on the roof of the office of Prime Minister Shinzo Abe. He said he took the course of action to protest the government’s nuclear policy. The man turned himself in at a police station in Fukui Prefecture - nicknamed Japan’s ‘nuclear corridor’ because it contains 14 reactors lined up along its coast - sources close to the investigation told Kyodo news agency on Friday. The self-confessed drone owner said his actions were provoked by the gradual restart of the country’s 48 nuclear reactors, which is scheduled by the government to commence this summer, despite surveys showing significant public opposition. A Chinese-made Phantom drone was found near the helicopter-landing pad above Abe’s office on Wednesday. However, it could have been there for several days before it was eventually discovered. The 50 cm diameter remote controlled device was clutching a water bottle containing liquid with trace amounts of cesium - a radioactive compound. The suspect said the cesium came from sand he picked from a beach near the Fukushima Daiichi nuclear power plant, which suffered multiple reactor meltdowns following the earthquake and tsunami in March 2011. The cesium levels were too low to cause any danger to humans, and it was below the exposure experienced by those flying inside commercial planes. The drone may have remained on the rooftop for an extensive period of time, if it had not been spotted by an employee giving a tour of the building to potential recruits. According to Kyodo, the police are now reviewing the validity of the drone operator’s claims. The ease with which a drone that could have been carrying a far more deadly cargo breached the security of the country’s most powerful elected official has resulted in a shake-up of Japan’s loose laws on unmanned aerial vehicles (UAVs). Japan’s Chief Cabinet Secretary Yoshihide Suga described the situation as a potential “grave crisis,” saying drones "could have a substantial impact on public safety and privacy protection, depending on how they are used." Among the suggestions touted by politicians are the introduction of a licensing system and compulsory insurance on drones, as well as a ban on flying them over sensitive locations. Suga said that the new legislation would come in to effect by the end of the current Diet session in June. The US went through a similar spurt of chaotic introspection after a drone landed on the White House lawn in January this year. A drunk official located in a nearby building was operating it. The US Federal Aviation Administration has been predicting an explosion in UAV use, but has struggled over the past several years to develop legislation that would take advantage of the low cost and convenience of drones, without creating innumerable public hazards.